Hi everyone! 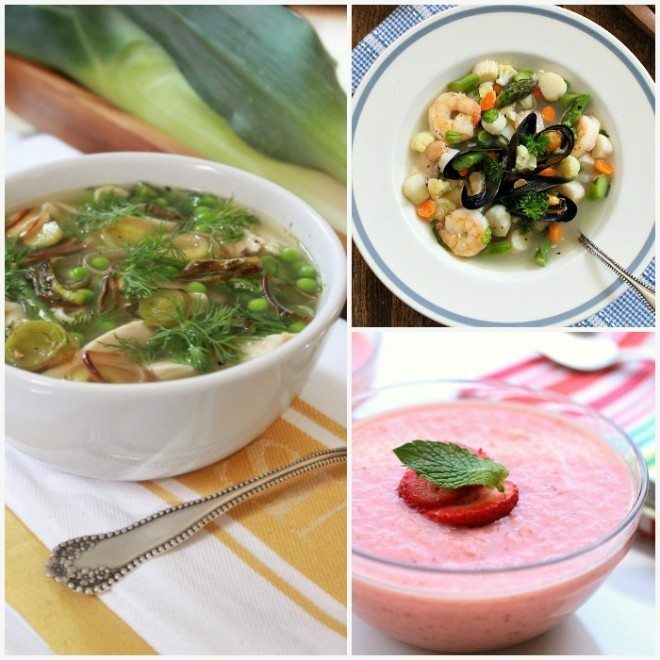 Such a pleasure to be back visiting with Jenny and her readers today to share my latest summer soup and tips for storing veggies and saving money on your produce bill. Are you pulling your hair out at the cost of groceries lately? Wow – the media is reporting that our food costs are going to increase by 5% over the next few months alone so we’ve got to come up with new and creative ways to continue our healthy eating without breaking the bank. 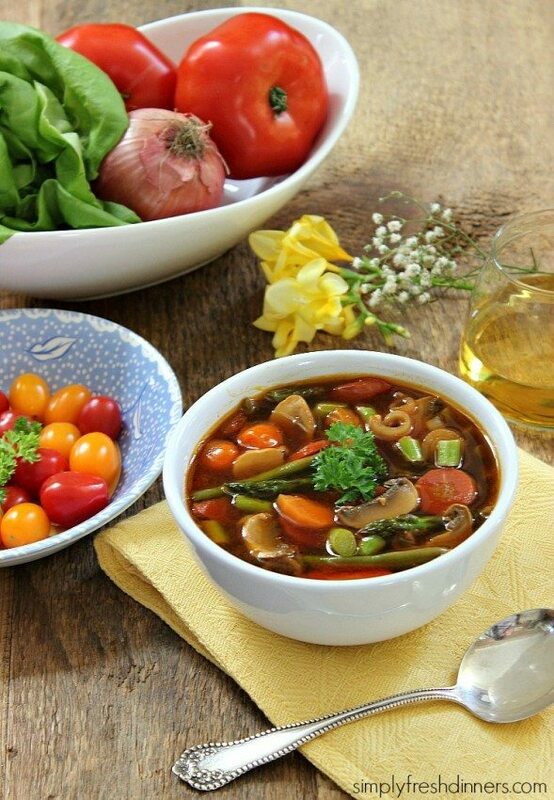 This Garden Vegetable Soup is a good start! This soup was so wonderfully delicious. It’s chock full of nutrients and I had a special treat in there – wild leeks from the farmers market. I’d never had them before and the taste was more intense than a regular leek. They are smaller and similar to spring onions in shape and size. I’ve included a lot of leeks in this recipe and combined with the fresh herbs and fresh lemon juice, your taste buds will be in for a surprise! This soup comes together very quickly and most of the work is in the chopping. Be sure you do all your prep before you start cooking because you don’t want your veggies overcooked. One of the ways to save on your produce is to start a veggie bin in freezer. 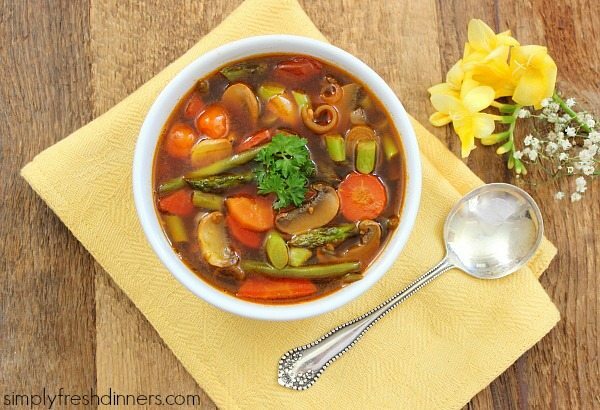 Toss in your leftover veggies that you don’t anticipate using before they go bad. 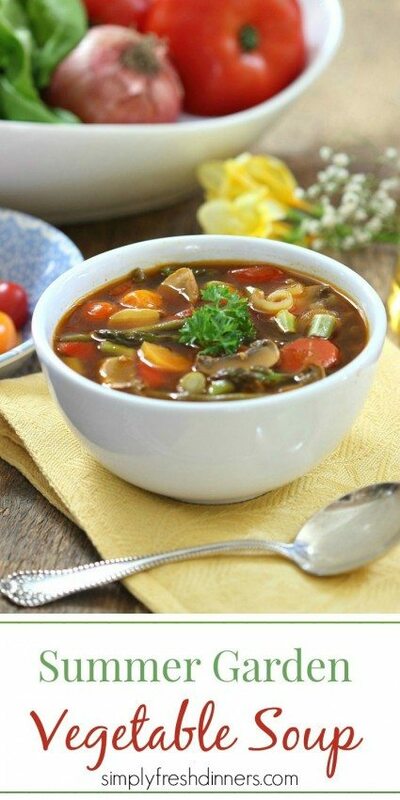 That will give you a great start to stews, stir-fries, soups and a great vegetable stock. If you’re wanting to learn exactly how to store your produce so that you can get the longest life from them, I’ve got a great article on my blog that will give you a print out chart that you can post in your kitchen for handy reference. You’d be surprised at what should be stored on the counter and not in the fridge. It’s been a big money saver for me. This recipe is super versatile so feel free to change it up with your favourite veggies and add some pasta or chicken. Most importantly, squeeze the fresh lemon juice over each bowl and garnish with extra parsley and basil – it’s all natural, healthy deliciousness at it’s best! 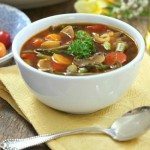 I’m a soup nut so I’ve included some of my other recipes here that I think you’ll enjoy. Thanks, Jenny. It’s been a pleasure! Heat oil in large soup pot over medium heat. Add leek, garlic and salt and sauté until soft, about 3-4 minutes. Add carrots and green beans and cook for another 3 minutes. Add vegetable stock and bring to a boil. Reduce to a simmer and add tomatoes, and mushrooms. Cook for 15 minutes, simmering on low heat. Add asparagus and half of the basil and parsley and cook for 2 minutes. Remove from heat and distribute into each serving bowl, squeezing a generous amount of fresh lemon juice over each bowl and garnishing with the remaining basil and parsley. Robyn lives in Canada and has an affinity for all things ocean, especially seafood. She loves finding new ways to create dishes with fresh ingredients, low in calories and most of all, DELICIOUS! She believes healthy dishes do not have to be time consuming and expensive and she wants to convince you of that, too! This soup sounds wonderful, Robyn! I tried growing leeks last year and just love them. I’ve never seen wild leeks before though. Thanks for sharing your recipe. And the photos are beautiful as usual. Have a good day! Hi Robyn, Love the flavor and smell of leeks and how they give such a wonderful warmth to a dish. Beautiful pics as always. Great tips too! Hello Robyn and Jenny, I hope you both are well. Delicious looking soup so nourishing and the little bit of lemon juice and parsley at the end really freshens this soup up. I see you have Chicory installed on the recipe? How is that working out for your guys? Sharing of course! Yes, the lemon juice really adds some pop. I wasn’t sure what you meant about Chicory until I clicked on the ingredients button. Didn’t know about that at all. Interesting!